When entering the lobby of a building for the first time, the feeling one has defines their experience of that space from that moment on. It reflects the owner’s brand, the architect’s vision and often what the tenants want their customers to encounter as they enter. This should be memorable. Increasingly, lobbies are not just places that you pass through – they are bustling hubs of social and business activity. Lobbies are meeting spaces, working spaces and even dwelling spaces. Yet, too often these lobbies are almost one dimensional and lack atmosphere and the exceptional experiences they could potentially offer. Up until now the experience in most lobbies has relied on the architecture itself or the use of traditional paintings or large scale murals. The odd immersive installation exists however our study of the lobby space in Australian cities compared to their overseas counterparts produced surprising results – most of them are dull! The increasing acceptance and deployment of public art is creating a new type of gallery – the lobby. Asset managers, architects and those responsible for the lobby aesthetic are now realising the potential of this space. It is early days however we are starting to see some pretty impressive installations on a global scale and one by one these are creeping into the Australian landscape. Custom lighting features are one of the ways to create something delightful (pardon the pun). The introduction of creative and immersive lighting installations into the lobby space can evoke an entire differently kind of atmosphere and one that literally delights its occupants. Whether the lobby is a commercial, residential space or hotel there is a growing desire for something special. The inclusion of lighting features if executed well will encourage users to dwell in lobby spaces which can turn them into bustling hubs of social activity. Thermal Energy by James Clar. In this article we have handpicked some fascinating examples of lighting in various forms that can be designed specifically for lobbies to introduce a little magic and create a space that people can interact with. Avant Apartments lobby glazing and lighting feature by The Blueprint. There are many types of lighting features such as sculptural, experiential, projection, neon and site specific. The examples we are showing you here are some that we have designed and delivered along with others from all corners of the globe as our curators have been looking for best in class examples of stunning light use. Lucent lighting sculpture by Wolfgang Buttress designed for the lobby refurbishment of the John Hancock Centre. Some of these are in lobbies and some of them are installations in galleries that could be adopted for use in lobbies. Either way we hope they inspire you. Introducing bespoke custom lighting features has the ability to hugely differentiate a lobby and what makes this even better is when the installation takes into account historical or contextual relevance. There needs to be a story behind the feature and this narrative is what sets spaces apart for the user. Light Sentences with Insets in Beverly Hills house by Laddie John Dill. From a planning perspective, lighting features should be included in the design process early on so that they can be integrated into the architecture and not be placed as an after-thought. The ability is there for these immersive installations to take centre stage as seen in the project below. We have entered a new age with lighting features and the use of LEDs and the future of the lobby will be better off as a result. Our Colour installation by Liz West. The Blueprint is a specialist design and delivery firm that curates and builds custom features for clients that create engaging experiences. With offices in Sydney, Melbourne, Brisbane, Shanghai and Los Angeles and a team of 25 staff we take concepts from ideation through to implementation. Since Apple introduced the iPhone, the word SMART has been used liberally as a marketing catch cry. Smart Phones, Smart Watches, Smart Cars and Smart Audio are examples of today’s appetite for products that promise to make our lives easier after making our purchase. While these products are inanimate objects which are not actually capable of thinking or decision making, they are all results of an investment in creative thinking and good design before they were manufactured. This principle doesn’t only apply to mass produced consumer goods. Custom manufactured products like signage also benefit greatly from creative, well considered design at the outset of a project. Choosing a signage company with a reputable design capability will translate into significant benefits over the lifecycle of the product. With the constant evolution of digital and LED technology, it’s essential to partner with a signage company that has broad exposure to technology advancements locally and overseas. Resolution, durability, content management and program software are all aspects of digital signage that are moving at a rapid pace and providing continuous improvements to the user experience. Digital technology is fast becoming a mainstream advertising medium with constant improvements to reliability and procurement costs making this technology more accessible and appealing to end users. It’s no accident that some of Australia’s major corporations have the most cost effective and functional signage on the visual landscape. These corporations understand that good industrial design and industry knowledge are the keys to realising savings during the manufacture and installation process. Design consideration at the outset of a project will ensure signage is manufactured and installed more efficiently with lower ongoing maintenance costs. End users are encouraged to consider using a signage company with proven design credentials and global industry experience to maximise value engineering opportunities and minimise procurement costs. While technology advancements and value engineering are key drivers in today’s contemporary signage landscape, material selection and manufacturing quality remain the anchors for delivering long term, low maintenance signage. The adage “you get what you pay for” remains true when it comes to signage materials, particularly when exposed to harsh external environments. End Users should expect their signage specialist to advise on the best brands and product types which offer industry benchmark performance and warranties. Signage must also be designed in a way that makes it readily accessible for service and maintenance. For example, installing transformers on the rear of a wall rather than within the sign itself may eliminate the need for expensive access equipment to service these components. While this seems logical, the drive for competitive pricing often means these measures are overlooked in the interests of short-term procurement savings. End Users are encouraged to have this discussion with their signage company at the outset of their project. Westpac asked The Blueprint to re-assess their signage program. Our design team recommended their signage suite was rationalised into a kit of standard sized components instead of multiple custom built signs. This rationalised suite of signs has been adapted across numerous Westpac branches, resulting in well integrated branding at each site. This process also enabled The Blueprint to offer bulk procurement pricing to Westpac, ultimately delivering around 20% saving over their previous procurement practices. The manufacture processes were also re-designed so the LEDs in the illuminated ‘W’ logos could be easily serviced instead of requiring full logo replacements. Finally, the red ‘W’ sign faces were changed to pigmented red acrylic instead of vinyl which was formulated to remain on brand by day and night when backlit, with the added benefit of greater durability to external elements. Why not contact one of The Blueprint team when your organisation is considering a signage project that will benefit from Smart Design. We are THE BLUEPRINT from Australia and would love you to join our Shanghai team!!! If you are interested in urban art, visual art (lighting features), industrial design, environmental architecture, landscape or other related designs, also with a good relevant education background and a strong interest in art design. Skills in Solid Works, CorelDRAW InDesign, Illustrator, Photoshop, 3d max, Rhino or CAD software, etc. Please send your CV and portfolio to HRSHA@theblueprint,com.au and we can arrange a further discussion! For every business in every sector, keeping costs down is vital. This is especially true when you are considering a rebrand of 100 sites, where every decision is multiplied 100 times. There is also a big difference between making smart financial decisions and cutting corners or dissolving the design intent of the rebrand. Lower cost and maintaining design integrity do not often go hand in hand, however with the right strategies you can have the best of both worlds. Here are three expert strategies to reduce costs and create efficiency in any rebrand. With a geographic spread of sites, diversity of building footprints and business priorities with differing store formats, building a strong plan and using a refined approach is key to ensuring that any rebrand is carried out efficiently. The pilot phase is often played down or done with a handful of sites and this can bring down the entire plan if the right mix of sites are not reviewed at the outset. It is essential for any rebrand that a diverse group of sites are reviewed. This process allows for an understanding of context, the identification of additional brand enhancement opportunities and the uncovering of each of the brand touchpoints. Each of these elements provides an essential platform for the rebrand and should always be considered prior to any design or specification. During the audit phase, each of the brand touchpoints need to also consider aspects such as standardised sizes, scale and placement. Building constraints should also be captured to ensure that each of the elements are considering the implementation, as this will have an impact down the line. Smart design is often overlooked, but it should be the hero of any rebrand. By developing a suite of brand touchpoints and standard sizes, coupled with consistent application, the ability to optimise the design and implement bulk procurement strategies is maximised. Specification of materials can also be done in such a way that you can balance the design and costs to a point of satisfaction. Materials should be considered for cost, durability and finish and when coupled with the right manufacturing processes will provide the best outcome. The integration of bulk procurement strategies will provide both time and cost savings. Building a strong procurement approach in the early planning stages will ensure that the rebrand is optimised. Rolling out the rebrand in groups of sites and by procuring batches of standard sign types is the most efficient model. When planning for bulk you should always consider; minimising the number of standard sign types, optimising the batch size for rollout, grouping in tranches and geographic spread, and designing for efficient manufacture. Applying each of these strategies will help streamline any rebrand and build a platform for success. You will not only see a reduction of costs but greater brand cohesion. Maintaining the integrity of the brand is what we do at The Blueprint. A strong brand identity is crucial for any company wanting to make waves in today’s market, and this extends right through to the design of their signage, and how their brand is translated in the built environment. In this article we highlight the vital steps to consider. It is important to understand how the audience will interact with a brand – an audience in a retail space will have very different needs from those experiencing a brand online. Because each environment differs, the application of the brand design needs to change to suit individual environments based on factors such as demographics, where the location of the site is and who is interacting with the brand. How will the space be used? Will the public be engaging with the space, as in a retail context or will it be for internal user groups such as in a commercial environment? A brand within a retail environment is directed to the consumer. However, branding within a workspace reflect the principles of the company and its culture. It is important to look broader than signage to the function of the space and brand experience, and to uncover how the agencies are intending the brand to be perceived. The selection of materials and finishes are vitally important, as it reflects on the brand values, demographics, brand essence and acts as the first impression of the brand in the physical environment. The chosen materials not only need to compliment the brand but also engage with and enhance the other elements in the environment. A 5-star brand for example is reflected in the luxury materials that would be specified such as polished copper, bronze and brass with polished or gold finish options in order to reflect the premium brand. For a more contemporary brand acrylic and polycarbonate signs provide the perfect solution with the potential for limitless design options, due to the wide range of colour options and colours that can be created to match a distinct palette. The context of the brand can determine whether illuminated lettering and lightboxes need to be used to create additional ways to light up and highlight key selling points. Internally illuminated signage is hard to miss, especially at night, and colours look bright and crisp. If a brand has a sustainable message then materials that feature a high level of recycled materials and upon the end of their lifespan can be fully recycled would be used, such as timber. A brand is transformed from a set of 2 dimensional guidelines, to 3 dimensional forms by extruding, developing shapes, applying materials and finishes and exploring the correlation of brand mark and physical space. Through the use of a multi-disciplined design team, the brand mark can be evolved into a suite of sign types and brand touchpoints. This approach allows for innovation and can often lead to creative and unexpected outcomes. Prototyping, testing and collaboration throughout the design process drive the best fit for purpose design outcomes. Due to the varying platforms that a brand must inhabit, it is fundamental that a brand has a framework within which it can adapt to a wide range of situations. A thorough understanding of materials, fabrication, engineering and manufacturing is essential. These details on how the different design elements are applied in a variety of situations should be documented in a comprehensive set of signage guidelines. The guidelines are established as a set of instructions on how to apply the signage in different contexts, at different scales and so on. They outline typography, layout of graphics, colours, materials, construction detailing and templates which are used for application to a network. They aid in consistency of both manufacture and application and help maintain the integrity of the brand as it is rolled out. Applying these principles will assist with creating a strong branded network. Each touchpoint will be consistent, fit for purpose and correlate with the brand essence. The Blueprint team have been assisting the Bank of Melbourne resolve and develop new specifications for their signage to ensure greater brand engagement and uniformity across their network of branches. Innovative techniques have been devised to implement custom faces that allow their logos to be brighter and better illuminated. Would you tell a major donor to get lost? That is exactly what happened at a major Australian university. Several years ago, I was consulting to a major University on a wayfinding project which came about because the University had missed out on a promised significant donation. The benefactor couldn’t find the Vice Chancellor’s office and left out of frustration. The donation was never made, so the Vice Chancellor then took a personal interest in improved wayfinding. The realisation to the University, this was a common experience that made it a doubly tough lesson. It left them wondering what else they missed. It also called into question the broader student experience, with the realisation that a great academic record might not be enough to attract and retain donations or students. It’s well known Universities operate in an intensively competitive, dynamic and increasingly de-regulated global marketplace for students. This is causing the reinvention of established campus models. Beyond touted academic reputations, a foundation of campus experience is an effective wayfinding system which can be understood by everyone. How else would even highly educated people know how to navigate? “provision of high quality environments, experiences and clear communication strategies that assist students to make connections with peers, support staff and the broader community”. First impressions count for more than just wealthy benefactors. Wayfinding is just one of many first impressions and ongoing operational challenges facing the education sector. Knowing the location of key destinations and how to navigate to them is critical for new visitors, the academic community as well as emergency services. The key to delivering effective campus wayfinding and a meaningful campus experience is to address the physical environment and the needs of its users, then develop strategies and actions. Then, collaborate with other specialists to integrate wayfinding, public art, digital and lighting to deliver a holistic experience. This is what we do at The Blueprint. It is essential that a university develops and implements strategies to attract local, interstate and international students to the university as a destination of choice. To retain quality students and create an ongoing connection to the institution, the student experience becomes central to the institution’s value proposition and sustainability. Students are seeking an intellectually and socially stimulating environment. Shaping universities’ physical spaces and how the campus looks is an integral part of that environment. This will be achieved through a holistic, student-centred approach across all dimensions of their experience. We recognise this within the team at The Blueprint. From the perspective of one of our landscape architects, Genevieve Mrost, whose expertise centres around urban spaces, wayfinding and placemaking. Genevieve Mrost studied at Unitec, Auckland, NZ. Strategies implemented by universities that achieve high satisfaction in student experience are always about the longer term, not chasing short-term advances through showy initiatives. The Blueprint has worked with a number of leading universities in Australia to assist with strategies to improve student experience and enhance reputation through the built environment. The key to creating a world class experience in universities is to begin with human centred design to produce a marketable experience, whilst remaining true to the institution’s core identity. This comes from collaboration with specialist designers and architects integrating signage, wayfinding, urban art, digital and lighting to deliver individual student experiences. This is what we do at The Blueprint. The University Experience. Making first impressions count. In the experience economy, how can universities differentiate their environments and make a first impression that is lasting and connects with students? Building a strong first impression has become the new differentiator for universities to attract students and build brand alignment. With increased online engagement, an influx of international students, and the expectation of an experience rather than just a place, universities now more than ever need to consider the entry experience. The need for universities to align the entry statement and brand is imperative to the overall experience. The entry statement is essentially the billboard for the university. The entry is an opportunity to set the theme for the experience and can also drive a point of difference for the University. Entries do not need to consist of just signage. They now extend beyond into urban art pieces and integrated treatments with landscape and architecture. Years ago, experience came last when planning new developments. Now in an economy where experience and first impressions differentiate, it is critical more than ever to provide a strong first impression aligned to the values and foundations of the institution. The key to making a strong first impression and resounding first time experience is aligning the signage, wayfinding, urban art, digital and lighting. This is what we do at The Blueprint. Vincent Tinto, author and University Professor at Syracuse University, first introduced his concept of retention in 1975. His model theorizes that students who socially integrate into the campus community increase their commitment to the institution and are more likely to graduate. The phrase ‘Sticky Campus’ is an idea being promoted by university directors, architects, planners and designers as a place that will make students want to stick around even if they have no lectures to go to. This contributes to a more engaging and meaningful student experience allowing them to improve academically and form closer relationships with peers and teachers. The Sticky Campus designs the environment to make formal and informal learning spaces, social spaces and cyberspaces more collaborative. This includes inter-connected digital classrooms and updated furniture. These provide learning areas for small groups working in individual pods or laptop benches as well as listening to a large-scale lecture. Social spaces provide a new mix of areas that allow for simultaneous learning and socialising as well as a place to have fun and relax with peers. This can include green spaces or activation areas. 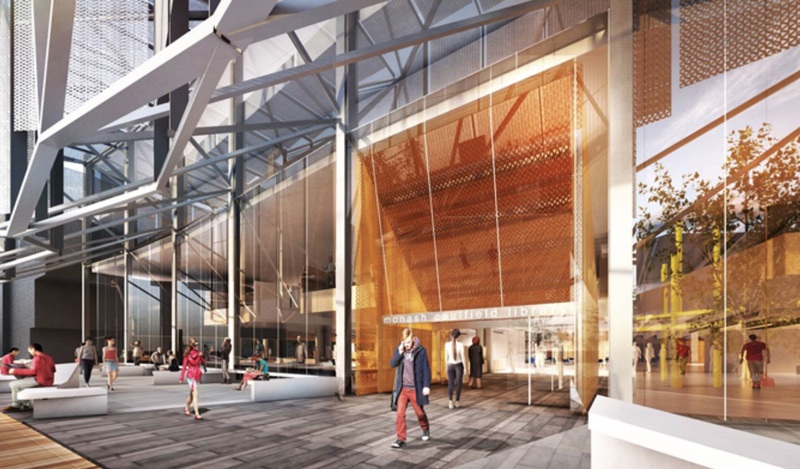 A recently completed project at RMIT has demonstrated the approach The Blueprint takes to making a sticky campus. As universities redesign their campuses, our industry has to re-think how we navigate, communicate and activate learning and social spaces in universities. This is what we do at The Blueprint. The Experience Economy of Shopping Centres? In the new experience economy, how will we create engaging Shopping Centre experiences that drive value? Can it extend to selling admission to a shopping centre? Today, building experiences to attract a crowd has become the new ‘magnet’, once the domain of cinemas and anchor stores. The concept spread from theatres and theme parks to airports and now shopping centres. Years ago, experience came last when planning new developments. This was a time when floor space and grand architectural statements were key drivers of new developments. A time when experience design consisted of lifestyle graphics on walls and centres that once lured inside, visitors couldn’t find their way out. Remember Melbourne Central 1.0 or the Sydney Skygarden? – they didn’t last! We have become consumers of Shopping Centre experiences; we’re demanding dynamic and engaging experiences, responsive to our needs. Experience design is taking over as the leading driver of new projects, fostering a shift to human centred design values. The key to making shopping centres part of the experience economy is to begin with human centred design to produce a marketable experience. This comes from collaboration with other specialist designers and architects integrating signage, wayfinding, urban art, digital and lighting to deliver individual customer experiences. This is what we do at The Blueprint. © Copyright The Blueprint 2014. All rights reserved.